There is a contrast in our lives, a constant flux of experiences ranging infinitely on an infinite spectrum. At any given moment we could be swinging from bliss to despair, or back again. This is the experience of humanity, and we have all experienced this at one time or another. Things are going well, we love the world, we love ourselves, we are all smiles and big plans. Or, things are not going well, we are introverted and angry, we are all despair and regret and bitterness. And these moments can be separated by months or by seconds. To step back, it sounds like I am describing an unstable mind. And I am. But not in a psychiatric context. The truth is that we are all subject to these changing tides and this is no more or less than the experience of living. We wake up, coffee is ready and we are pleased and we have a good morning, we get to work and we have an unpleasant email and we sulk through our lunch. This goes on all day, and then all week, and so forth. The more even-tempered of us will blame these experiences on circumstance outside of our control and will accept the bad mood and patiently ride out the swing of their mood pendulum, eventually arriving at the bliss end again. But this, this is still the mind of someone who is asleep. Remembering her lesson helps me when I find my own life cycling from one end of the spectrum to the other, but what is most important in this work of staying outside of the spinning is my practice. We come to practice because it is time set aside where we can step outside of the cycle. Outside of the spectrum of emotion, and we can observe the cycle for what it is. Our practice puts us in touch with our own buddha-nature and creates a memory of this space outside of thought and emotion cycling. The better acquainted we are with that space, the easier it becomes to find it not only on our mat but in our lives, whether the coffee is made early or not, whether we hit all of the red lights or cruise through the greens, we practice to prepare ourselves for the experience of living in this world. This week, I am trying to step up my own practice and add some extra time on my mat and in meditation at home. I encourage you to make some new space and renewed commitment to your practice this week! Finding the extra hour and change for class can be difficult, but try finding just 10 minutes to sit quietly watching your breath and your thoughts. I’m talking about formidable pose because, for a time I was completely and utterly obsessed with this posture (in Sanskrit, Ganda Bherundasana). It was about 2 years ago that I first met the pose and fell in total awe. Perhaps three months later I had found the pose myself. For about six months I had a daily practice of formidable, I wanted badly to master the pose and it was actually the first inversion that I felt totally comfortable with. After a few months of this, I started toppling over in formidable. First about a year ago, I was taking my feet towards my head and I just completely collapsed, I bit my lip terribly. I bled on my mat. I had a swollen sad lip for several weeks. I did not stop the pose. Then, I began toppling over all the time in this pose. I burned my throat on the carpet practicing this pose at home. Suddenly, I was terrified of this posture that I had been in such deep worship of. In the end, the experience really made me step back and re-evaluate the way I had begun approaching my physical practice. 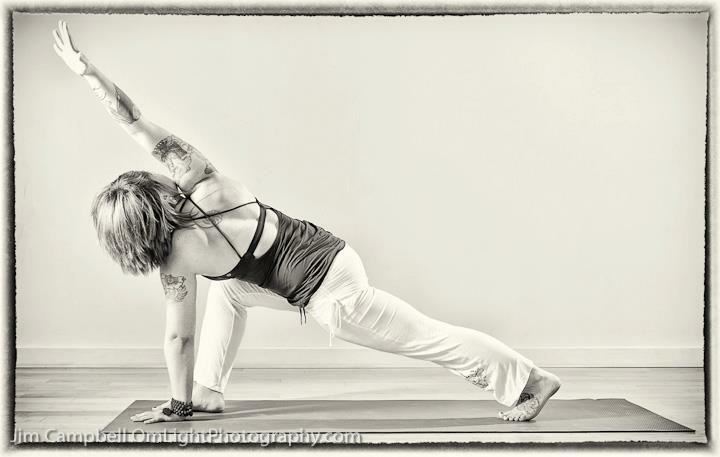 Even after telling my students that they didn’t need to meet any level to be “good” at yoga, that any variation of any pose was welcome and we had no goals for asana, I had allowed myself to become completely goal oriented in my own practice and as a result had put my body in harm’s way. But then again, it is often times easier to offer compassion to other’s than it is to offer compassion to ourselves. When I realized I had wandered so far off-balance, and had literally opened my back bending practice to a place where my body could no longer balance, I completely changed my approach. I started running as a way to re-establish my own physical boundaries (running makes you tighter in virtually all of the places that a backbend is opening you). I had always hated running, I am not sure I had ever run more than one mile straight in my lifetime until last year. But I thought this was a good experiment in getting me out of my back bending bad habit. I found out that running gave my practice new power, strength and stability, and felt amazing. Now, I balance my practice in a much more even way. I work with equal vigor on moving in all directions, forwards, backwards, twists, arm balances and inversions. It doesn’t mean I enjoy all parts the same, but I respect them all as equally valuable to our own well-being. And I am miraculously still running, being careful about my alignment as a runner and incorporating more bodywork into my schedule to keep me running injury free. So far, so good! This week I am teaching about preference in my classes. And it has given me an opportunity to think about all of the ways that I show my own preference in my practice and in my body. We prefer one leg to another, one shape to the next. On some level, we will always have favorites, but we should be mindful of how our preferences affect our actions. Just as we learn to stand evenly on both feet, not favoring our right to our left, we can learn to move through our life with more balance and stability by examining our own habits. As for Formidable, it remains my favorite pose, but for completely new reasons. My experience through this pose has completely redefined the way I practice. I still love its appearance, it seems to me we are prostrating and showing gratitude, but my own gratitude for this pose has come from the incredible lessons it has taught me. Summer is, somewhat suddenly, upon us. In my body, early summer time makes me feel a little lazy, sluggish, and congested in my muscles and joints. Warm weather, especially when it’s sudden, retains the water in our system and causes expansion in soft tissue so noticing a little bloat when the weather changes is pretty normal. On top of that, summer months mean barbecues, beers, fried seafood and margaritas. Salty and sweet snacking on top of alcohol consumption only adds to the stickiness in your body, and certainly doesn’t help much with bloat. The good news is, the warm weather allows our muscles and joints to get juicy and loose much faster than in the frigid winter. Getting yourself to class when it’s so pretty outside can be tough, but even just a one hour stop at the studio will help you combat all of the grogginess of summertime. And, once your body begins to move, you’ll warm up much faster in an active practice, and most likely, you’ll find a nice continuous sweat during your practice. Sweating detoxifies our whole system, rids you of excess water (bye bye beer belly), and indicates that you’ve warmed your system creating space and ease in all of your joints and muscles. My favorite practice for this purpose is twists! This time of year (and especially after a holiday weekend!) calls for the warming and cleansing practice of twisting. From simply reclined twists to more active revolved chair poses, any and all are welcome on my mat! Twists revitalize the organs and the spine by first compressing, squeezing out any stuck fluid or molecules, then opening up the spongey tissues to re-absorb happy nutrients. Twisting strengthens the abdomen and the obliques, and helps relieve tension in the shoulders and the chest. Twists wring toxins out of the system and through the intestinal tract, making them a perfect post-barbecue remedy. If you’re experimenting in your home practice this week, try adding some simple lunge twists into your sequence. Add this pose into your standing poses, repeating it a few times on each side and holding for several breaths. hold at least 5 breaths and switch sides. April’s showers seem to have been delayed into May. We’ve had a lot of puddles, thick wet air and worms on the sidewalks this month. This kind of weather shrinks up your muscles and connective tissues, making your tight places feel tighter. For me, and maybe for you, that means my hips and hamstrings start talking to me a little more than usual. Try this yummy seated pose for a little rainy relief! a juicy forward bend that releases hips, groins and low back named for a sage. To come into this pose, sit on your sitting bones, as tall as possible. cross your right leg in front of you as if you were sitting cross legged in Sukhasana. draw your left leg in so that your knee points straight up and your heel lines up with your left sitting bone. your left foot is crossing in front of your right leg, traditionally this pose is done with the right leg in lotus but this position puts a lot more pressure on the knee and is only appropriate if you are warmed up and should not be tried without a teacher. the left side of your seat might lift a little off the floor as if you were squatting, this is okay but stay aware of your lower back on this side and keep the back long and open by reaching your sit bone straight down. now you are ready to fold over the right leg, on the inside of your left thigh. keep your spine long and reach your chest forward as if you were going to lay it down beyond your right shin. if you’d like to wrap the arms around the left thigh and the right side of your low back and bind your hands behind your back this is an option if a bind is a regular part of your practice. another variation would be reaching your hands forward to release the upper back. hold about 10 breaths, release slowly and do the other side!